The Best of Halloween Baking Championship on Monday, October 1st at 10pm. 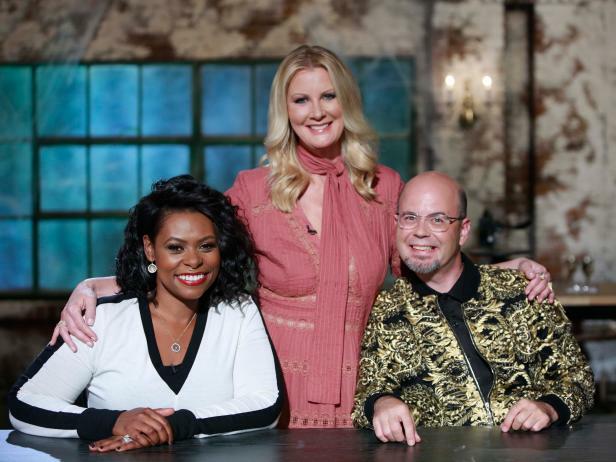 Sandra Lee returns to Food Network as host of a competition show called Haunted Gingerbread Showdown which premieres Sunday, October 7th at 10pm. A new series Halloween Cake-Off with Duff Goldman as host on Monday, October 8th at 10pm. Trisha Yearwood has a Halloween special called Trisha’s Halloween Spooktacular on Monday, October 15th at 8pm. New primetime episodes of Beat Bobby Flay, Big Food Truck Tip, Bite Club, Diners, Drives-Ins and Dives, Guy’s Grocery Games, Halloween Baking Championship, Halloween Wars, Kids Baking Championship, and Triple D Nation. New daytime episodes of Barefoot Contessa: Cook Like a Pro, The Kitchen and The Pioneer Woman. FOOD NETWORK CELEBRATES HALLOWEEN ALL MONTH LONG WITH NEW SERIES, RETURNING FAVORITES AND ALL-NEW SPECIALS! New York – September 5, 2018 – Food Network is ready for Halloween this October with new series, returning favorites, themed-episodes and all-new specials to celebrate the season with tricks and treats all monthlong. First, take a trip down memory lane with the country’s top Halloween bakers on the special premiere of Best of Halloween Baking Championship on Monday, October 1st at 10pm. Next, the exciting new competition Haunted Gingerbread Showdown challenges teams to put a Halloween spin on the classic gingerbread house premieres Sunday, October 7th at 10pm. Then, Duff Goldman hosts Halloween Cake-Off, pitting four top bakers against each other to see who can create the most ghoulish, outlandish and spooky Halloween cakes on the special premiere Monday, October 8th at 10pm. Next, past Chopped winners re-enter the kitchen for another chance at the ultimate title on the tournament premiere of Chopped Champions on Tuesday, October 9th at 9pm. Trisha Yearwood is celebrating her favorite holiday with a huge party filled with friends, family and, of course, delicious food on the special premiere of Trisha’s Halloween Spooktacular on Monday, October 15th at 8pm. Also in primetime, don’t miss new episodes of Beat Bobby Flay, Big Food Truck Tip, Bite Club, Diners, Drives-Ins and Dives, Guy’s Grocery Games, Halloween Baking Championship, Halloween Wars, Kids Baking Championship, Triple D Nation and Worst Cooks in America. In daytime, Ina Garten returns to share her expert tips and tricks with a new season of Barefoot Contessa: Cook Like a Pro on Sunday, October 21st at 12:30pm. Plus, catch premieres and themed weekends with new episodes of Let’s Eat, The Kitchen and The Pioneer Woman. FoodNetwork.com is full of Halloween tricks and treats. Join the Food Network conversation on Facebook, Instagram, Twitter and Snapchat Discover. Premiering Thursday, October 4th at 10pm – “Fright Club” – HALLOWEEN EPISODE! There’s a thrill of fear in the air when TV personality Jesse Palmer and Food Network’s Eddie Jackson step into Bobby Flay’s arena. Frank “The Bull” Terzoli and the City of Brotherly Love’s John Patterson shake off the scare as they prepare to face Bobby and deliver his worst nightmare. Michael Strahan and Michael Symon have handpicked two chefs hoping to score a touchdown on Bobby Flay‘s home turf! New York chef Anastacia Song and Southern sweetie Joey Ward are prepared to bring their best game and score the win. It’s a family affair when father-and-son chefs Beto and Julian Rodarte battle it out to prove that the only thing stronger than family is their desire to beat Bobby Flay! Cookbook author Daphne Oz and model Jourdan Dunn will then decide who has the chops to take Bobby down. Sonoma County chef Tracey Shepos Cenami and Jersey-strong John Vitale fight for the right to battle greatness. If they want to beat Bobby Flay, however, they’ll have to impress the sophisticated palates of Alex Guarnaschelli and Michael Voltaggio. Premiering Wednesday, October 3rd at 10:30pm – “Turning Up the Heat in Charleston” – SEASON FINALE! Andrew Zimmern explores the outskirts of historic Charleston, where the food truck competition is fierce and dreams are big. He meets the owners of Brunch Holiday, a Charleston native and his British wife, who both gave up 9-to-5 jobs to open their truck and serve a fusion of brunch traditions from the American South and the British Isles. Then Andrew savors classic Southern cooking at Johnny’s Homemade Biscuits, which specializes in flaky biscuits, home-cured meats and chicken and waffles. Across town, he discovers a father and son who lure customers to their truck, Squeals on Wheels, with the telltale scent of a barbecue smoker. With items like the Piggy Parfait, their unusual menu keeps their fans coming back. Finally, Andrew rewards one deserving culinary dreamer with a $10,000 tip and a Food Network seal of approval. Online, keep up with all the action using #BigFoodTruckTip and see insider photos and highlights. Head to Food Network’s Facebook and Instagram pages all season long to catch behind-the-scenes moments. Tyler Florence brings together five of the best chefs in Charleston, to compete in a contemporary Southern cuisine restaurant. The kitchen gets stocked daily with items fresh from the coast, so the chefs must search the pantry and fridge for whatever works best with secret ingredients like smoked pork sausage and bitter blood oranges. Then the two remaining chefs duke it out to see who can use lobster, saffron and anything else they can find to make a dish that wins the Bite Club Champ title. Premiering Thursday, October 11th at 9pm – “A Wok on the Wild Side” – SEASON FINALE! In a town famous for spicy Southern cooking, Tyler Florence brings together five of Nashville’s best chefs to compete in a modern Chinese restaurant. Creative chops are put to the test with their first-ever experiences using massive woks and steam baskets. In the final round, things get wild when the two remaining chefs must impress the judges by mixing creamy dairy with fiery Asian ingredients to become the city’s Bite Club Champ. Online, meet the chefs competing for hometown glory. Plus, watch videos of some of our favorite finds in each city and follow the action on social media using #BiteClub. Premiering Tuesday, October 2nd at 9pm – “Halloween Hijinks” – HALLOWEEN EPISODE! Martha Stewart is thrilled to celebrate her favorite holiday, Halloween, as a judge in the Chopped kitchen. All manner of spooky fun is found in the first basket, including a scary sight in a martini glass and macaroni and cheese in a clever package. A witch’s cauldron holds a green, savory surprise in the entrée basket, and it is demolition day at the haunted gingerbread house as the final two chefs make their desserts. Online, get to know the competitors, browse photos of the action, and watch video highlights at FoodNework.com/Chopped. Tell us your ideas for grilling with the mystery basket ingredients using #Chopped. Chopped Champions – Premiering Tuesday, October 9th at 9pm – TOURNAMENT PREMIERE! In pursuit of $50,000, four Chopped champions are back at the stoves with renewed ambition, seeking to be named the best of the best! The appetizer round is as exciting as they come, and a fire extinguisher is used for the first time in Chopped history. Extreme examples of salty and sweet meet in the second basket, and a colorful, unconventional surprise in the dessert basket gets a “wow” from everyone, but can the chefs get it to work in their final plates? Four Chopped champions come back fiercer than ever with their sights set on the tournament’s $50,000 grand finale. The chefs create wildly different appetizers from a basket that includes black garlic. A novelty candy in the second basket requires a hammer and some culinary imagination, and plenty of competing flavors in the dessert basket leave the chefs with some decisions to make. Online, learn more about the contestants returning to the chopping block. Get culinary inspiration from the Chopped experts and learn the tricks contestants have successfully deployed to transform ingredients into winning dishes. Follow #Chopped for highlights from the competition and tell us what you would do with the basket ingredients. It’s an international affair as Guy Fieri revisits old favorites. The Triple D Nation took notice in Miami when a Latin-inspired place opened a fast-casual joint to serve the masses, and their burger tower is the talk of the town. A Hawaiian hideaway in Seattle has branched out to serve sweet island treats, and a Denver restaurant takes Korean barbecue to the next level. Plus, there’s a bonus, never-before-seen-on-Triple-D Italian hot spot that Guy visits every time he hits Chi-Town. Ain’t no thing but a chicken wing in Coeur d’Alene, Idaho, when Guy Fieri stops by to taste a couple of new eats they’ve added. A Nashville barbecue spot has a new take on the old standard wings, and a joint in Miami is keepin’ it real with a variety of new dishes, including drumsticks and duck. Guy Fieri is digging into everything from pretzels to pimento cheese. In Bozeman, Montana, he checks out a five-star take on breakfast with a Mexican pork masterpiece and a French toast Monte Cristo. In Little Rock, Arkansas, there’s a microbrewery serving up elevated pub grub like scratch pretzels and a gumbo-cheese fry mashup. Plus, don’t miss a funky farm-to-table spot piling up a pimento cheese burger and cranking out their own homemade brats. On this trip, Guy Fieri is going from the bomb burgers to a taste of Italy. In Little Rock, Arkansas, there’s a funky joint pairing their craft brews with all kinds of on-the-bun creations. Plus, two brothers are putting out real deal Italian, like homemade lasagna and raviolis. And in Santa Rosa, California, Guy stops at a sandwich shop dishing out all kinds of righteous recipes. Premiering Wednesday, October 3rd at 9pm – “Flavortown Fright Night” – HALLOWEEN EPISODE! Things are getting freaky in Flavortown as four fearless chefs play Guy Fieri‘s scariest games for a stab at a $20,000 shopping spree. First, Guy gives the chefs a frightening ingredient that they must feature in a spicy dish. Then, the chefs left standing must choose what to cook using Guy’s spooky menu-item refrigerator magnets. The Flavortown family gets a little bigger as some of GGG‘s most beloved judges, Richard Blais, Antonia Lofaso and Aaron May, bring their siblings to compete alongside them. First, the teams must shop for everything in their ‘Childhood Favorite’… BLINDFOLDED! Then, Guy’s Wheel of Opportunity determines which required ingredient they must use in their ‘Decadent Dish.’ One chef will get the necessary help from their sibling that will put them over the top to win a shopping spree with up to $20,000. There’s no cluckin’ around when four chefs come to Flavortown to compete in three chicken-themed rounds to prove their poultry prowess. First, Guy Fieri challenges the chefs with making a ‘Fried Chicken Combo’ on a $17 budget. Then Guy gives the chefs a list of ingredients they must feature in their ‘International Chicken Dish.’ Finally, the chefs face Guy’s triangle of terror that will determine the details of their ‘Winner Winner Chicken Dinner.’ In the end, only one chef will fly the coop with a shopping spree worth up to $20,000! Guy Fieri invites four superstars to Flavortown for three more rounds of heavy heat. First, the chefs face a modified food pyramid to determine the types of spicy ingredients they must use in their ‘International Heat’ dish. Then, Guy has them shopping for ingredients to their ‘Spicy Chicken Dishes’ in teeny-tiny shopping bags. Finally, the remaining chefs brave a brand-new game that determines which unique, spicy ingredient they must feature in their ‘Spicy Fried Dinner.’ Will the chefs make it to the final round? Will the judges? Find out which chef handles the heat and wins an automatic $15,000 on GGG‘s most outrageous show ever! Pigs are flying in Flavortown when four chefs put their swine-dining skills to the test making Guy’s pork-inspired dishes. First, the chefs must shop for ingredients in their ‘Surprising Pork Dish’ with some not-so-big, piggy-faced back packs. Then, things get a little wild when Guy has the chefs pick key ingredients to their ‘Pork Sandwich’ using Guy’s unpredictable deck of cards. Finally, Guy breaks the piggy bank and challenges the chefs to make a ‘Swine Dining Dinner’ on a $20 budget. In the end, one chef will send the others squealing all the way home and win a shopping spree worth up to $20,000. Online, learn more about your favorite judges, see photo highlights and test your knowledge of Flavortown Market. Tell us which games are your favorite using #GroceryGames. In the Silence of the Yams pre-heat challenge, bakers make yam desserts that evoke classic scary movie clichés from chainsaws and hockey masks to bloody knives and creepy dolls. In the main heat, the bakers turn a pumpkin patch into a “bundtkin patch” by creating a pumpkin patch out of mini bundt cakes. Host John Henson and judges Carla Hall, Lorraine Pascale and Zac Young decide who goes home. A monster has ransacked the kitchen and is on the loose! The bakers work together in the pre-heat challenge to create a 3-D suspect sketch out of Pate a Choux to help track him down. The sketch helps puts the monster behind bars but now he’s hungry for the main heat challenge that involves monster-sized Halloween desserts like giant cupcakes, pies, cream puffs and more. A tough decision is made by host John Henson and judges Carla Hall, Lorraine Pascale and Zac Young. It’s bridal season for Halloween lovers and since bridal showers often have petit fours, the bakers are creating “petit horrors” in the pre-heat challenge. In the main heat, it’s time for a Halloween wedding! Each happy couple — vampire and troll, werewolf and mummy, skeleton and robot, witch and goblin, zombie and ghost — gets a unique Halloween wedding cake. Host John Henson and judges Carla Hall, Lorraine Pascale and Zac Young judge which baker failed to keep up with the rest. A group of talented bakers enter the fortune-telling tent at the Circus of Dread in the pre-heat challenge. The competitors are tasked with creating tarot card desserts featuring blood orange, fig or passion fruit. The bakers then enter the Creepy Clown Hall of Fame in the main heat where they create impressive desserts that will land one of them in the finale. Host John Henson and judges Carla Hall, Lorraine Pascale and Zac Young determine which baker’s fortune has runout. Premiering Monday, October 29th at 9pm – “Cranium Epicurean” – SEASON FINALE! Inspired by a mysterious “skull man,” the bakers enter the graveyard to bring skull desserts to life in the pre-heat. For the main heat, the bakers must create a championship-worthy nightmare cake based on common nightmare themes like falling, being chased or being visited by the dead. The baker that can face their fears and come out on top will be named Halloween Baking Champion! Best of Halloween Baking Championship – Premiering Monday, October 1st at 8pm – HALLOWEEN SPECIAL! Online, get inspired by photo galleries of the contestants’ tastiest treats and browse the judges’ most-elaborate costumes. Weigh in on the competition and share your own sweet creations on social media using #HalloweenBakingChampionship. Halloween Cake-Off – Premiering Monday, October 8th at 10pm – HALLOWEEN SPECIAL! Four professional bakers face off in an unconventional competition to find out who is the master of creating the most ghoulish, outlandish and spooky Halloween cakes. The competitors must prove their expertise to host Duff Goldman and judges Waylynn Lucas and Pichet Ong both in the studio and in their own bakeries, and the baker whose cakes most impress the judges in all the competition categories — presentation, transformation and taste — is crowned the winner. Online, find everything you need to pull off an epic Halloween bash, complete with Duff’s top tips. Grab your favorite witch’s brew and check out Food Network’s Facebook page for scary-good Halloween recipes, party essentials and decor ideas that will leave you speechless. Follow Food Network and #HalloweenCakeoff on Instagram to get Duff’s essential techniques for baking and decorating cakes you’ll crave, and Waylynn and Pichet answer Halloween trivia. Five remaining teams made up of an expert pumpkin carver, a cake artist and a sugar master go into battle to create amazing and tasty Halloween-themed displays that depict an epic face-off between clowns and zombies. Special guest judge John Kassir, the actor behind the unforgettable voice of the Crypt Keeper on the TV series Tales from the Crypt, joins host Jonathan Bennett and judges Shinmin Li and Todd Tucker. Four remaining teams consisting of an expert pumpkin carver, a cake artist and a sugar master put their skills to the test to create astonishing and delectable Halloween-themed displays that show what happens when a witch trades in her tired old broom for a brand-new ride. Writer, director and producer Mick Garris of the iconic film Hocus Pocus joins host Jonathan Bennett and judges Shinmin Li and Todd Tucker. The remaining three teams made up of an expert pumpkin carver, a cake artist and a sugar master pull out all the stops to create stunning and scrumptious Halloween-themed displays that bend time and space to show their vision of Halloween time travel. Actor Gaten Matarazzo of Stranger Things serves as special guest judge with host Jonathan Bennett and judges Shinmin Li and Todd Tucker. Premiering Sunday, October 28th at 9pm – “Outbreak!” – SEASON FINALE! It’s the spine-tingling finale of Halloween Wars! The final two teams made up of an expert pumpkin carver, a cake artist and a sugar master have slaughtered their competition, and now they’re facing off in one last epic showdown. The team that can best illustrate a terrifying worldwide outbreak and the race for an antidote will be crowned Halloween Wars champions and win $50,000! LeeAnna Vamp, actress, model and horror culture icon, joins host Jonathan Bennett and judges Shinmin Li and Todd Tucker. Online, browse photo galleries of the spookiest creations and meet the teams. Tell us what you think of the competition with #HalloweenWars. Haunted Gingerbread Showdown – Premiering Sunday, October 7th at 10pm – SERIES PREMIERE! Ghosts, goblins…and gingerbread?! In this four-part competition, nine of the best gingerbread artists in the country craft spooky gingerbread creations celebrating things that go bump in the night. Three winners will compete in the finale for a chance to win the $25,000 grand prize and be featured in Food Network Magazine. But beware, these aren’t your grandma’s cute gingerbread houses. With surprises lurking around every corner, these wildly haunted original creations tell a darker story. Host Sandra Lee challenges three chefs to create gingerbread masterpieces in honor of the 30th anniversary of Beetlejuice. Judges Jason Smith and Jamika Pessoa are joined by guest judge Elvira, Mistress of the Dark, to determine who will advance to the finale and get a shot at the $25,000 grand prize. Host Sandra Lee challenges three talented chefs to create a Halloween party for the ghosts, ghouls and many other stars of the frightful holiday. Chef and restaurateur Raffaele Ronca joins judges Jason Smith and Jamika Pessoa to see which competitor’s gingerbread creation is worth advancement to the finale and a shot at the $25,000 grand prize. Host Sandra Lee tasks three chefs with creating a haunted theme park in gingerbread form. Each competitor faces their own dark night of the soul during the competition and must rally in order to stay in the game. Cake designer Barbarann Kym joins judges Jason Smith and Jamika Pessoa to determine who will advance to the finale and take home the $25,000 grand prize. Premiering Sunday, October 28th at 10pm – “The Ultimate Haunted House” – SEASON FINALE! Three Haunted Gingerbread Showdown winners return to compete in the frightful finale! Each chef must create the ultimate haunted house out of gingerbread if they want to take home the $25,000 grand prize. Host Sandra Lee and judges Jamika Pessoa and Jason Smith are joined by some very special Halloween fans that are expecting epic work and will decide on a winner. Online, meet the competitors and browse photos of the tastiest haunted houses you’ve ever seen. Follow #GingerbreadShowdown to see how these sweet monstrosities were built and to weigh in on your favorites. Trisha’s Halloween Spooktacular – Premiering Saturday, October 15th at 8pm– HALLOWEEN SPECIAL! Trisha Yearwood is throwing the most terrifyingly delicious Halloween party! She gathers her closest friends to help pull off the ghoulish gala, from testing out deadly costumes to preparing her spookiest dishes. Edible sea creatures, bloody dessert bars and fiery cocktails set the festive mood. The party kicks off with the unveiling of Trisha’s terrifying decorations and perfect zombie costume, and her guests experience her shattered glass room and green, slimy, tentacle room as well as dine on her buffet of eye-popping creations. Trisha ends the night with a zombie-filled, candy-coated Halloween jam. Visit Food Network’s Facebook and Instagram pages and follow #HalloweenSpooktacular for a complete lineup of spooky offerings from the set of Trisha’s gloriously ghostly home in Nashville. Get a sneak peek at Trisha’s and her guests’ over-the-top costumes on Instagram Stories, plus step-by-step snapshots of her party-ready recipes, and tons of tricks and treats you won’t want to miss. Online find a roundup menu of devilishly delicious fright-night fare, along with behind-the-scenes photos and top video moments from this Halloween extravaganza. Barefoot Contessa: Cook Like a Pro – Premiering Sunday, October 21st at 12:30pm – SEASON PREMIERE! Ina Garten is sharing all her tips and tricks for how to Cook Like a Pro. You’ve been invited to all her fabulous parties, and now America’s hostess with the mostess is sharing techniques and professional strategies along with incredibly elegant and easy recipes. She’s throwing open the doors of her Hamptons home for delicious food, dazzling ideas and good fun. Ina Garten loves mixing fancy and casual fare, and she’s sharing her secrets to this winning mashup of high and low. She takes everyday Potato and Celery Root Purée over the top with truffle butter and serves it with stunning Seared Scallops. Then she pairs an elegant Roast Filet of Beef with simple Mustard Mayo Horseradish and Crusty Baked Potatoes with Whipped Feta. Finally, she adds a little fizz to dessert with an awesome Raspberry and Cream Sgroppino. Ina Garten shares recipes that use her favorite good ingredients starting with good chocolate in her Chocolate Pecan Meringue Torte. Next, good maple syrup and lemon are turned into sublime side dishes including Maple-Roasted Acorn Squash as well as Tuscan Roasted Potatoes and Lemon. Good mustard is the magic ingredient in her Crispy Chicken Thighs with Mustard Sauce that are good enough for company. Finally, good salt is the secret to her Salty Oatmeal Chocolate Chunk Cookies, officially Ina’s favorite cookies ever. Online, browse Ina’s top recipes, watch videos and brush up on your entertaining skills. Share photos of your best kitchen creations inspired by Ina using #BarefootContessa. The Kitchen is packing the flavors of fall in every bite with dishes like Jeff Mauro‘s Chicken Marsala Pasta al Forno and Geoffrey Zakarian‘s Kale Caesar Salad. Chef Lara Lyn Carter joins the gang to make a Pumpkin Streusel Coffee Cake. Katie Lee serves up Cauliflower Tacos with Sriracha Black Beans and then, Katie Pix stops by with a One Pot Sausage Stew. Finally, the hosts play a round of Try or Deny with new fall flavors. Premiering Saturday, October 13th at 11am – “Squash N’ Pumpkins” – HALLOWEEN EPISODE! The Kitchen is celebrating fall with the two stars of the season: squash and pumpkins! Katie Lee makes her sweet and sticky Grilled Pumpkin BBQ-Glazed Pork Chops and Sunny Anderson whips up her Quick Wild Rice and Sausage Stuffed Mini Butternut Squash. Jeff Mauro makes a creamy Cacio e Pepe e Zucca pasta, and Katie puts her spin on squash with Spaghetti Squash Crust Pizza. Baker Renato Poliafito brings some pumped up Pumpkin Whoopie Pies and Geoffrey Zakarian spices things up with his Maple Chai Spiced Pepitas. Plus, the hosts share the fall trends they’re into and over this season. Let’s Eat tackles recipes that sound difficult but are surprisingly easy to make. Jamika Pessoa takes the dread out of bread with her simple recipe for No-Mess Cinnamon Bread in A Bag. Stuart O’Keeffe conquers Easy Eggs Benedict for a crowd, and Vivian Chan has a mess-free tip for slicing watermelon. Later, Brandi Milloy shares a two-ingredient recipe for the World’s Easiest Chocolate Mousse served in a Cookie Bowl, and Vivian makes a perfect sip and snack combo, refreshing Sangria and Fruit Salsa with Sweet Heat Pie Chips. Let’s Eat is playing around with food illusions and clever takes on foods that aren’t what they seem. Ashley Foxen stops by to make her lookalike Cheeseburger Cupcakes and Fries. Stuart O’Keeffe makes a Mushroom “Pulled Pork” Sandwich with smoky barbecue flavor that tastes like the real thing, and for dessert, Jamika Pessoa whips up an unbelievable Butter Cracker Apple Pie — with no apples, and Vivian Chan shares a trick for a cheesy twist on a traditional wedding cake. Stuart visits Milk Tavern, a Los Angeles cereal bar that serves cotton candy burritos, and Brandi has a sweet surprise with her PB and J Ravioli. Let’s Eat is celebrating everyone’s favorite food group: carbs! Brandi Milloy kicks things off with a sweet and gooey Pull-Apart Confetti Cake, and Vivian Chan shares a tip for cutting perfectly even cake layers. Jamika Pessoa adds a satisfying crunch to Crispy Egg Noodle Wrapped Shrimp, and Stuart O’Keeffe combines two guilty pleasures for his decadent Pasta and Potato Pierogi Lasagna. Later, Vivian stops by FryGuys to check out the Frycano, a three-tier tower of fries, and Brandi piles the toppings on her Nacho French Fries. Premiering Sunday, October 28th at 9am – “Sweets and Treats” – HALLOWEEN EPISODE! Let’s Eat gets into the Halloween spirit with spectacularly spooky treats. Brandi Milloy makes sticky and sweet Candied Apples dipped in white chocolate, sanding sugar and melted marshmallow. Vivian Chan shares her trick for festive Halloween treats, and Stuart O’Keeffe has a secret for making savory Meatball Mummies. Jamika Pessoa scares up a cheesy Jack-o-Lantern Onion Dip and then digs into a wicked, crowd-pleasing snack with her Cookies and Scream Graveyard Crunch. Online, access all the recipes from the hosts, collect their culinary hacks, browse behind-the-scenes photos and videos plus much more. Weigh in on your favorites with #LetsEat. Ree Drummond is sharing recipes from her pizza place in town. For takeout with a difference, she makes Foolproof Pizza Dough, Garlic Butter and a no-cook Pizza Sauce and uses them for her Triple Pepperoni Pizza and her signature pie, Pizza Ree-a. A mashup of Caesar Salad and adorable Not Knots produces one awesome salad, and the Naughty Cowgirl cocktail is a spicy hit at the bar. The Drummond family is throwing a farewell dinner for college-bound cousins Paige and Caleb, featuring a spread of their favorite food. Ree Drummond makes two side dishes, Brown Butter Mashed Potatoes and Roasted Cauliflower Salad, that will pair perfectly with the Simple Salad with Simple Ranch. Ladd and his brother, Tim, are in charge of the Drummond Grilled Rib Eyes, and a show-stopping Strawberry Shortcake Trifle is a sweet sendoff for the frontier freshmen. It’s a busy day on the ranch for Ree Drummond as she fills her freezer with breakfast favorites and makes breakfast for the guys out working cattle. Her to-make list includes Freezer Breakfast Paninis and Very Berry Croissants, which are easy to heat and eat down the line. Herbalicious Breakfast Casserole is an awesome make-ahead dish, and her Frozen Yogurt Bark is part treat, part sweet. There’s a burning on the prairie, but in Ree Drummond‘s kitchen, everything is sweet, stocked up and frozen. She’s making Mini Turtle Cheesecakes that are elegant enough for impromptu entertaining and incredibly simple Ice Cream Truffles two ways. Grab-and-go Peanut Butter Protein Bars power up the kids for work on the ranch, and Ree’s shortcut Frozen Tiramisu Cake packs classic flavor into a frosty slice. Ree Drummond is sharing some of the recipes that have rocked her chocolate-loving family’s world through the years. There’s Ladd’s Chocolate Pie, his all-time favorite dessert, and Chocolate Butterscotch Caramel Bars for her father-in-law, a lifelong chocoholic. Ree also makes Dipped and Decorated Waffle Cones with Triple Mint Chocolate Chip Ice Cream and a single-serving microwave Chocolate Cake in a Mug. October means fall sports! We’ve got game day covered all season with Food Network chefs and personalities’ best recipes for hot dips, wings, nachos, meatballs and chili. Fall Produce Guide – Find the best recipes for seasonal produce, like squash, sweet potatoes, apples and Brussels sprouts, easy, 5-ingredient fall recipes, plus learn how to buy, store and prep fall fruits and vegetables. Fall Entertaining Guide – Serve guests hearty fall comfort food like chili, pot roast, pasta dishes and roast chicken – in our Fall Entertaining Guide you’ll find the best dinner-party recipes for the season. Fall Weeknight Dinners – Rely on our seasonal weeknight dinners package for easy meal solutions for busy weeknights. Get dinner on the table quickly with pork chop, chicken, pasta and casserole recipes that will be on the table in less than 40 minutes.